I really don’t know what to say about this book. It’s good, but I just didn’t feel it. I judge a book based on the impact it makes on me; to me a book is good when it touches me deep down, shatters my soul.. I just didn’t feel anything like that while reading Hopeless. I had high expectations, because of Slammed – that book was just amazing, it really hit me! 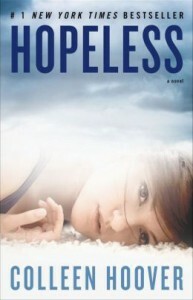 This doesn’t mean Hopeless isn’t a good book, because it is, do not doubt Colleen Hoover – she wrote it well; plot is original, all the pieces fit together.. Perhaps it’s the main character, Sky, she’s just so detached, and the romance was just a little bit too intense, too much… Everything about this book is a little bit too much for me. The trauma is just too great. Sky and Holder were lovely characters, I liked their interactions, they’re so relaxed and natural, there were some really funny scenes; but still I’d take Lake and Will anytime. One of the high points would be Karen’s story; her character is really good and her story actually touched me more than Sky’s did. Can’t say more without spoiling it, but I think she’s really brave! So, this is really subjective review; I still think this is an interesting book worth reading (for I’ll read anything C. Hoover writes). Just because this book didn’t sit well with me doesn’t mean it won’t amaze you. I know some people found Slammed to be quite ordinary, whereas to me it’s one of my favorite books.